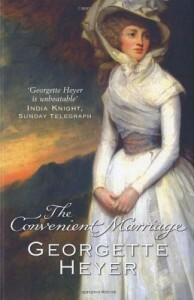 The Convenient Marriage - The More I Read. . . There are so many things I loved about The Convenient Marriage by Georgette Heyer, but there are a few little hiccoughs that held this one back from being a sparkling gem like, say, Venetia. (Love, love, love Venetia!!). I'm not sure when I enjoyed reading a first meeting between two principals, Horatia Winwood and Marcus Drelincourt, Earl of Rule, more. 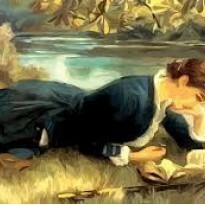 Horatia 'Horry' may be very young, just 17, but I loved her boldness, her fearlessness, her honesty, and her determination. In one fell swoop, Horry frees her older sister, Lizzie, from an unwanted match with the Earl of Rule, ensures Lizzie will marry her true love, Edward Heron, and replenishes the depleted Winwood fortunes. How does a young lady of little beauty, no fortune, a regrettable stammer, and Kahlo-esque eyebrows persuade a man-of-the-world like Marcus Drelincourt, Earl of Rule, to marry her? Well, she charms the pantaloons off him for starters. Of course employing a surprising frontal attack to peaking his interest also didn't hurt her case either. 'Have I said s-something I shouldn't?' inquired Horatia doubtfully. 'It would remain a pity if you did,' said his lordship. 'Yes, I had noticed,' the Earl answered gently. 'If you f-feel you c-can't bear it, sir, I shall quite understand,' Horatia said in a small, anxious voice. It's the 18-year age difference, however, that makes Rule reluctant to go forward with Horry's plan. But Horry assures him the difference is not an issue for her, that she, in fact, wants to marry him. Further, she promises not to 'interfere' in his life, i.e., his mistress. I think the age difference didn't bother me so much because Rule recognizes she is just too young, she isn't ready to settle down. His gentle but firm manner allows her to play at being an adult, to sow a few wild oats as he waits and watches over Horry till she matures. His patience and understanding with Horry's immaturity was one the reasons I fell in love with Rule. After they marry, Horry gets quite a name for herself with her madcap exploits, not the least of which is an unfortunate gambling habit coupled with the Winwood bad luck, racing gigs to St. James on a dare, spending way too much money on all the latest fashions, and befriending Lord Lethridge, not only 'the wildest rake in town' but also a man Rule is rumored to have fought a duel with over Louisa, Rule's sister, years ago. Though Rule doesn't stifle Horry, he's always there quietly and firmly setting things to rights as she entangles herself in scandal after scandal. Even Louisa, who genuinely likes Horry, is exasperated with her antics, concerned that he not only appears foolish but that she'll ruin him socially and financially. When she admonishes him to 'take a stick and beat her', he languidly objects because it would just be too 'fatiguing.' Horry was like a kid in a toy store with an American Express 'black card' for such a long time that I confess I lost patience with her, especially when she flounces. Yes, she's young, but heaven save me from a flouncer! There are a a few times when I noticed Horry is perhaps not particularly proud of her actions. When Lizzie marries her Edward, Horry is aware that Lizzie has probably heard about some of her exploits and is reluctant to engage in 'intimate conversation' with her sister. This seems to show she is embarrassed and maybe a little ashamed. But I also think some of Horry's reluctance for a heart-to-heart with Lizzie is based on a little envy of her sister's love match, a marriage she's just beginning to want with Rule. I also wondered if some of her outrageous behavior was just a way to lure Rule's attention away from Lady Massey, his mistress. Her burgeoning affection for Rule is both confusing and confining to her. After all, she promised not to interfere in his lifestyle, but I think by this time she's yearning for the kind of marriage Lizzie and Edward will have. When and how Horatia falls in love with Rule was a bit muddied and pretty much all 'off screen.' In fact, I was sure she was more interested in Lethridge than Rule for a long time. But there was this surprising glimpse into Horry's thoughts when people began to couple her name with Lethridge's. The sauce being, of course, Lady Massey, and whether Rule is in love with his mistress. So I had to go back and re-read the part where Horry learns just exactly who Lady Massey is. She had had no idea that Lady Massey, whom she's acquainted with, is also Rule's mistress. That bit of information was spitefully hinted at by Crosby Drelincourt, Rule's cousin and heir presumptive and a ridiculous 'Macaroni', as payback for Horry's mockery of his foppishness one night at the opera and was his way to ensure Rule and Horatia's marriage remains 'convenient' and not a love match. Then Horatia sees Rule at Lady Massey's box during intermission, questions her brother, Pelham, and receives confirmation of that lady's status. The candid green eyes lifted to his face. 'Is R-Rule in love with Lady M-Massey?' Horatia asked bluntly. She may not have married Rule for love but it's clear that by this time Horatia's emotions are engaged. Why else would she be 'forlorn' when confronted with evidence of the thing she swore not to interfere with? So perhaps 'muddied' isn't the best word to describe Horatia's journey to falling in love. Perhaps 'subtle' is a much better descriptor. More importantly, I realized this book is much more weighted on Rule's journey than Horry's. He is the star of this show. One of the first 'aha!' scenes in which Rule's nascent feelings for Horry (as well as Horatia's for Rule, I might add) are shown beautifully was in a conversation that ostensibly deals with Horatia's outrageous behavior but also has these tantalizing threads of his yearning for a closer relationship with her. Horatia, returning from a visit to her mother, is petulantly defiant with Rule's request for a moment of her time after she discovers Louisa has been discussing her latest exploits with Rule and suggested that he beat her with a stick. You just have to love a man who understands paying mega bucks for shoes. Though he has couched this discussion in terms of questioning Horry's extravagances as well as curbing her desire to shock the Ton, it is his next statement that points to a more relevant reason for this 'Come to Jesus' meeting. 'B-but you're my husband,' Horatia pointed out. He laughs with her about the monkey stealing Crosby's wig, lightly dismisses her allowing the monkey to dine at his breakfast table, and commiserates on the exorbitant price of being fashionable, but he stumbles a bit on the words 'found -er assisting' her toilet. So I asked myself: Why was he visiting her boudoir while she's dressing, hmmmm? A reconnaissance mission maybe on the state of Horatia's emotions? At the very least it signifies more than just curiosity about his wife. Plus, he actively seeks her out not only this time but others as well. Though he still appears amused by Horry's behavior, I believe there was a little disappointment that she turned to those 'young' men for assistance with patches, etc. There's also the fact that he has begun to pull away from Caroline Massey. The lady herself notes as much soon after this scene. Rule's hides his disappointment of his wife's allowing 'young' gentleman into her boudoir behind a languidly ironic admission that being a husband is indeed a disadvantage, but this is not the only clue that he sees, or is beginning to see, Horatia as more than a 'convenient' wife. Rule is completely imperturbable as far as Horatia's shocking behavior, showing no more than a consistently placid humorous acceptance of all of her peccadilloes. Except for one thing. He is indeed worried, very worried, about her 'excessive gaming.' Her inability to pay her bills from his very generous provisions troubles him enough that instead of a languid smile and an airy dismissal, he ...frowns. I wasn't sure Rule knew how to frown till now. He's not even aware of the frown till Horry points it out, and he quickly reverts to the 'frippery fellow' who finds most things in life, er, fatiguing. If this were a game of poker, Rule just gave away his hand. Unfortunately, Horatia doesn't recognize it for what it is. Rule is such wonderful character. To misquote Ogden Nash, Rule would have been content to live his life 'in nonchalance and insouciance were it not for' loving Horatia 'which is rather a nouciance' for him, I'm sure. He is a steel trap wrapped in blue velvet, with a fall of lace ruffles and a perruque a bourse who languidly pinches snuff, eschews an involvement in 'Politicks' and 'Debates in the House' for invitations to card parties written on pink paper, and enjoys making life for his 'prince of a secretary' Mr. Gisborne the veriest trial. Yet the man who just can't be arsed engages in a sword fight for his wife's honor with Lethridge that rivals the one between Inigo Montoya and Westley. Rule who upon learning of his cousin's involvement in coupling Lethridge's name with Horatia's tells Crosby he's lucky Pelham fought a duel with him because he would have used a cane on him instead of a small word and cuts Crosby off financially. How energized Rule becomes where Horatia is concerned! Not to mention the Mysterious Man in the Scarlet Domino. What a great scene that was! I suppose it's in character for him (at that particular time) to just continue seeing Caroline Massey since he would probably consider it too 'fatiguing' to find another mistress while he waited for Horatia to grow up. But that smacks of shallowness of character as well as a healthy dose of Ye Olde Double Standard crap to me. I was encouraged, however, to see that the more Horatia becomes a part of his life and his heart, the more he pulls away from Caroline Massey. Additionally, the ending was a little abrupt. I really wish some of the latter hi-jinks with Pelham, his friend, Pom, and Captain Heron had been shortened in favor of a little longer ending between Horry and Rule. Although I will admit I laughed out loud at the scene of these three and Hawkins the Highwayman teaming up to waylaying unsuspecting travelers along the road to London. I loved the light and playful tone as well as the humor sprinkled throughout The Convenient Marriage. When Rule is on stage, he really is the star, a very strong charismatic personality, and one I enjoyed reading a lot. Though Horatia's wore on my nerves a bit (just say no to flouncing! ), I loved her imperfection. Lethridge as the villain is very well realized and almost as fascinating as Marcus Drelincourt, the Earl of Rule is. That's one book I wish had been written. Despite a few problems, The Convenient Marriage is very much worth spending a few hours with as well as earning a place on my keeper shelf.